The Gatlinburg Sky Lift is one of the most loved attractions in the Smokies! With some new and exciting additions coming in 2019, it’s expected to be better than ever! To help you make the most of your visit there, we put together a list of all the things you should know about the new and improved Gatlinburg Sky Lift Park. Since 1954, the Gatlinburg Sky Lift has become a Smoky Mountain tradition for locals and visitors alike! 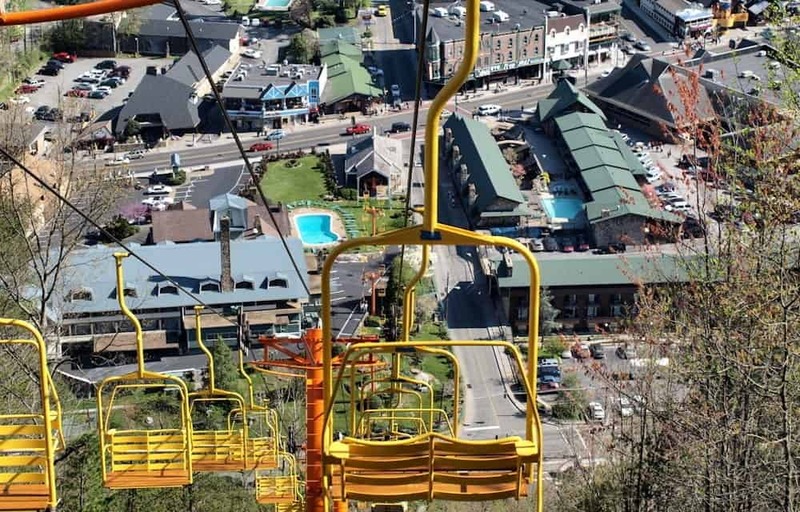 The adventure begins as you and up to 2 other people take a seat in one of the chairlifts in the heart of downtown Gatlinburg. You will then travel 500 vertical feet to the top of Crockett Mountain. Along the way, you’ll have one of the best views for miles around as you look out over the lively downtown area and sweeping mountain vistas! When the SkyDeck and SkyBridge are complete, you will be able to step off at the top and take in the gorgeous scenery. Until then, you can enjoy a smooth and scenic ride as you travel in a loop, up and back down the mountain. The SkyBridge is set to open sometime between April and May 2019, and will be the longest pedestrian suspension bridge in North America! It will stretch 680 feet across a deep valley, and you’ll be able to walk across it at your own pace while you take in the spectacular views. There will even be glass floor panels in the middle of the span where you can look down 140 feet to the ground below. If there’s one picture you get while you’re at this attraction, you’ll want it to be on this amazing bridge! The grand opening for the SkyDeck is also set for sometime between April and May 2019 at the Gatlinburg Sky Lift Park. This expansive viewing deck will feature a fantastic restaurant and bar, where you can grab lunch and a craft beer or two. There’s also a gift shop for you to explore and pick out some souvenirs to remind you of your trip. Seating areas are available on the deck where you can kick back in an outdoor chair and enjoy one-of-a-kind mountain views. No matter how you choose to spend your time at the top, you can always look forward to a breathtaking ride back down the mountainside. Why spend precious time driving to get to popular attractions when you could stay just a few minutes away from all the action? Our Gatlinburg cabin rentals are conveniently located near the downtown area. However, they are also just far enough away that you can still enjoy uninterrupted fun with friends and family. You can choose from a variety of rentals offering 1 to 9 bedrooms and all the amenities your heart desires at a reasonable price! The Gatlinburg Sky Lift is one of the most popular and well-loved attractions in Gatlinburg, and you can experience it for yourself when you visit! Be sure to check out all of our Gatlinburg cabin rentals so that you can stay just a short drive away!